A number of art sites have this body perspective project. It’s a project the kids enjoy, and they all seem to know what they want to portray. The kids traced their hands and feet on colored construction paper, glued them to a background sheet and drew in the action they wished to portray. Directions can be found under “Fall Back” in the 3rd Grade Projects Gallery in the sidebar. 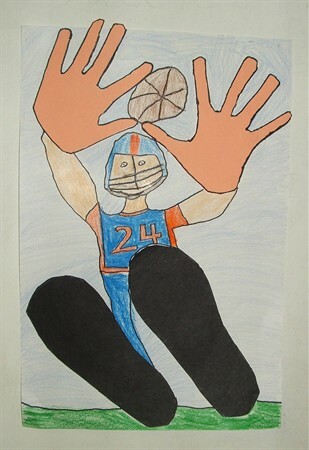 This entry was posted in 3rd Grade and tagged art, body perspective, classroom art, crafts, fall back, for kids, kids fall back, perspective, perspective art projects for kids, perspective drawing for kids, projects. Bookmark the permalink.